A portion of the cost for organizing the AKB48 Senbatsu Election 2017 was paid for by Okinawa’s government-allocated promotion budget to encourage tourism, Mainichi reports. The “Okinawa Promotion Subsidy” allows the prefecture to voluntarily choose how to use it. For fiscal year of 2017, Okinawa reportedly received a total of 135.8 billion yen (~$1.226 billion USD). Entering the fiscal year, the prefecture requested money to be set aside to for AKB-related events. The Cabinet Office approved the grant of 28 million yen (~253,000 USD) to pay the venue fee and bring more people to Okinawa. Over 10,000 fans were expected to gather and fill the venue at Toyosaki Villa SUN Beach on the main island of Okinawa to see the finals results for the 322 participating candidates, as well as witness AKB48’s 5th sister group STU48 make their concert debut. Newly appointed foreign Minister Taro Kono, who has served as the head of the Liberal Democratic Party’s Administrative Reform Promotion Office, criticized this allocation, saying that a transient event is not sustainable in the promotion of Okinawa Prefecture. 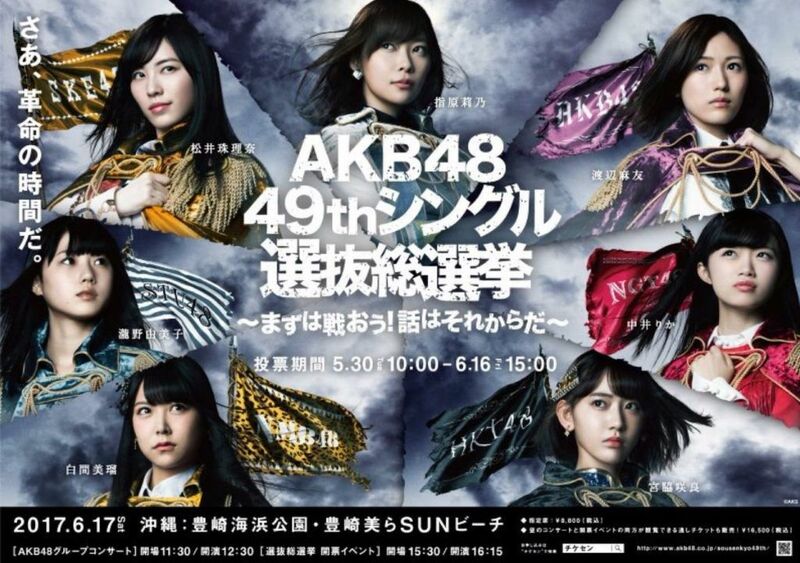 Despite all this, weather developments deemed the event unfit to be held, and AKB48 management made preparations for the event results to be announced at a local community center.